Hi I'm Jay, and today we are going to talk about how to diagnose your Aprilaire digital humidistat. Alright, the light is blinking, and it says "call dealer for service," and we have an E3 fault code. 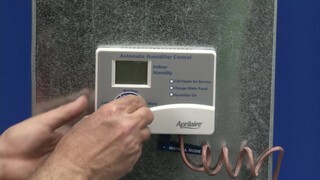 E3 tells us, if you look at your manual, that there's a problem with the outdoor temperature sensor. Now, this one happens to have the "manual mode" resistor on it, so there is a problem with it, because that is what is attached in lieu of the outdoor temperature sensor. So, what we're going to want to do is turn the power off before we start messing with this thing, so let's kill the power first. Now that the power's turned off, let's take off the cover, pull the knob and snap off the cover. Ok, now if we take a look inside there, and we look real close at this manual mode resistor, you can see that the two wires that come from it are shorted out against each other, so we're just going to straighten that out. There we go, that's now straightened out, they were shorted out before, and now they're no longer shorted, so, they're seperated, we're just going to go ahead while we're in here and just tighten up these two screws, attached to it, make sure they're tight, very good. Alright, now we can put the cover on and turn the power back on and see what happens. Ok, we've seperated the two wires that were touching each other on this manual mode resistor. We have the power back on. The "call dealer for service" light is no longer on. It no longer says E3 error code. Let's spin this around, see if our humidifier comes back on and test--Yep, our humidifier comes on. 36 percent, alright everything appears to be working just great now. So our only problem is our wires for the manual mode resistor were shorted out to each other. Now the same thing will happen if one of the wires breaks, or if this manual mode resistor were to fail. That E3 code is telling you, that the value that is it looking for, is within a range, from X to Y, and it is out of range. It is either, not enough resistance, in other words shorted out, or a resistance value that's too high. Which would mean that one of the wires was broken. The same holds true for the outdoor temperature sensor. So here's an outdoor temperature sensor. Right here. Normally, for a lot of people, this is what is attached to those two terminals, the ODT Terminals, in lieu of this little resistor. So what often happens with these is this little sensor here is stuck on an outisde wall and maybe your dog chewed on it, or someone hit it with an implement or a tool. Uh, lawnmower or whatever. They've broken it. So once you break this device, you will have no signal coming back to the control, and it will kick up the E3 failure code. So, we're going to show you how to check this. Now, we have the 58 model humidistat, and this has an outdoor temperature sensor on it. And everything is working fine, and we can flip this thing over here. If you take a look at the display, it says 37%, that's the humiditiy here in our video studio, we spin it around and we can get it turned on, we spin it to the test position. It says humidifier on, so we are now running the humidifier. we'll run it for about a minute, then it will start to blink, and it will eventually turn off the humidifier after one minute. So we're going to see what happens when we have a fault code. And, the fault code we are going to use is E3. Ok, now we have an E3 error code, which is telling us there is a problem with the outdoor temperature sensor. So, we're going to turn off the power to the unit, get a meter out and check it. first thing we want to do, again, is turn off the power. Ok, we turned off the power to the furnace, and the humidifier. the display is blank, right now, so we're going to find out why we have an E3 error code. Let's take the cover off, and right here we have the terminals, that are marked, ODT. Ok, we're going to disconnect these two wires, so we can get the sensor wires in our hands. Ok, im going to pull them both out. Alright we're going to get our meter out and check the OHM value that we're reading here. Ok, there we go. So it says "overload." so, it's infinite resistance, basically. Which means, it's not seeing anything. So it doesn't see our outdoor air sensor at all. So what we're going to want to do is find out why, so we cna go out to the sensor outside and take a look at it, and find out. Ok, so we've gone outisde and we've taken a look at out outdoor temperature sensor, and here's the new one, and we've found out that the end of this, of the temperature sensor outside, is missing. So it must have got hit by a shovel, or a dog chewed the end of it off, but anyways we're going to replace it. And see what happens. So here's the new one, we're going to go outside and replace this now. Ok, so we've replaced the outdoor temperature sensor, and if we take a look here, kind of hard to see, but it says 46.4 K. So it's 46.4 thousand OHMS, resistance. Ok, so that equates, if you look at the chart in the owner's manual, that equates to about 20 degrees Fahrenheit outside. which, oddly enough, it happens to be. So it's 20 degrees outside, we get a value here of 46.4 thousand OHMS, that matches the temperature outside, everything is good. So now all we have to do is reconnect these wires, and turn the power back on and test it. Ok, let's disconnect these, we're going to reinstall these wires. Let's put the cover back on. Reinstall the knob, there we are. Alright, leave that off for now. Now we'll turn the power back on and test it. Ok, so we've switched the power back on, and as you can see, everything is working again, we no longer have the E3 error code, is telling us that the humidity in our space is 37 percent, and that is correct, so we're going to spin this around, and see if the humidifier will come on. Alright, we're spinning it around in the test position just for the heck of it, humidifier light came on, the humidifier is now running, everything is working great. So, we're fixed. Now we can set this back, to whatever setting we want. So we're going to leave it on 5 right now. Thank you for watching, for this and other products, visit us, at AirQualityParts.com.